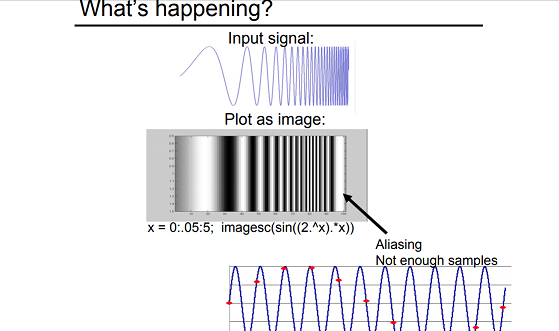 How to plot an input signal in image? Given an input signal(ex. 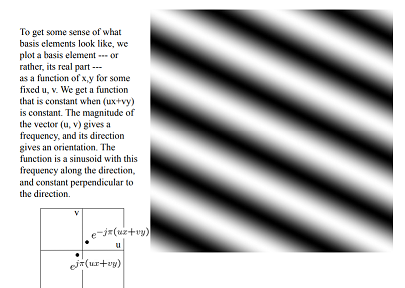 sine) how can one go about plotting an image like below ones(the stripped black and white image)? The images are from these slides on image processing. If you're using Python, you can use a library such as matplotlib for this. It can take a numpy array and plot it as a standard chart using the function plot or as an image using imshow. The resulting image/plot can be displayed in an interactive window, or saved to a file, or it shows inline in your Jupyter notebook if you're using that. There are other (better?) Python chart plotting libraries but the functionality is basic and IMO matplotlib is easier to get started with (perhaps just because it's older and more established). You can also do this using OpenCV, if your input is an OpenCV image. Its plotting functions are named similarly to the matplotlib ones. OpenCV is available in Python, C++, and a handful of other languages. Not the answer you're looking for? Browse other questions tagged image-processing antialiasing or ask your own question. How to generate a 2d histogram? How to compare anti-aliasing effects on images ?